Without the access to free and reduced school lunches, summer is the hungriest time of year for many children. The Foodbank of Santa Barbara County set out to end this with its monthlong campaign, End Summer Hunger. The goal was to raise $50,000 to go towards the Picnic in the Park Program, a country-wide program that provides children under 18 with free, nutritious meals when school is not in session, regardless of their parents’ income. Thanks to a generous anonymous pledge, Picnic in the Park surpassed its goal by $25,000, raising a grand total of $75,000. To donate and get involved, visit the End Summer Hunger website or to find locations where lunches will be served text SUMMERFOOD to 877-877. For more information, visit the Santa Barbara County Foodbank website. This entry was posted in News on August 7, 2015 by Judith Smith-Meyer. Foodbank of Santa Barbara County raised $75,000 during “End Summer Hunger,” its month-long campaign to raise $50,000 to help feed the most at-risk school-age children during the summer months. Thanks to a generous anonymous pledge, the community responded and the campaign surpassed its goal by $25,000. Campaign funding will support the Foodbank’s county-wide Picnic in the Park program, which provides free, healthy lunches to ensure that all children continue to receive nutritious meals when school is not in session. There are no income requirements and any child 18 and under is welcome to receive lunch. Picnic in the Park to date for summer 2015 has served 23,000 lunches and will continue until the end of August. For many children who receive free and reduced-priced meals at school, summer can mean hunger. 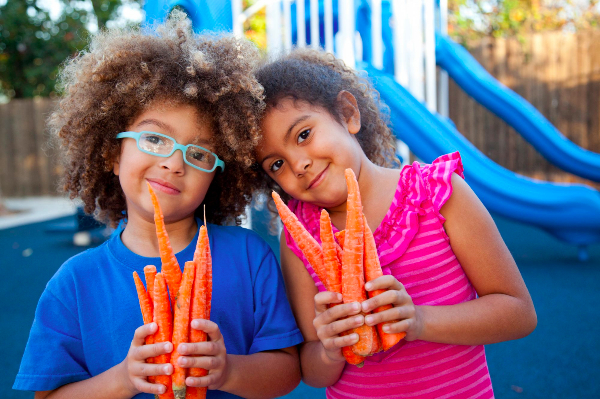 The “End Summer Hunger” campaign, which ran June 1–30, is crucial in both closing the summer hunger gap in Santa Barbara County and promoting wellness and healthy eating during summer months. Children comprise 35 percent of the people the Foodbank serves. In our County, 34,000 children who receive free or reduced-priced lunches during the school year don’t receive any meal assistance during the summer, a time of critical brain development. To support these children, the Picnic in the Park program provides over 35,000 nutritious meals for 2,500 local low-income children during the summer (over 900 meals per day throughout Santa Barbara County). On a typical day, Picnic in the Park serves children from many diverse backgrounds including five-year-old David, who loves spiderman and comes to have lunch with his babysitter, Carmela, who takes care of more than six kids everyday from different working families. And Maria, a soon-to-be fifth grader, says her favorite part of Picnic in the Park is playing with her friends—she also loves when the lunches include Goldfish crackers. To donate and get involved, visit endsummerhunger.org or to find locations where lunches will be served text SUMMERFOOD to 877-877 or visit Find a Lunch. End Summer Hunger leadership-level sponsors include: Aera Energy and Santa Barbara Women Lawyers’ Food from the Bar Drive, as well as generous support from Citrix, Chevron, Hazelwood Allied Moving and Storage, Mentor, Oniracom, Sodexo, KCRW, Subway, Vita Travel Store and FLIR Systems. This entry was posted in News on August 6, 2015 by Judith Smith-Meyer. School is almost out for the summer. For many kids that means, vacations and time at the beach. For some children, summer means hunger pains from lack of food. The Foodbank of Santa Barbara County has launched a new campaign to end summer hunger. Mansbach organizes a monthly “Family Philanthropy Volunteer Day” at the Foodbank where volunteers sort fresh produce and put together community food donations. There’s also a big social media push to raise awareness. Foodbank encourages anyone who wants to help inspire others to make a difference to take a photo of their own lunch at home, work or a local restaurant, then share it on Facebook, or Twitter using the hashtag #ShareYourLunch.